Do You Have a Stalker? Although I am an avid reader and a very critical author, I rarely find a novel that demands shouts from the rooftops. 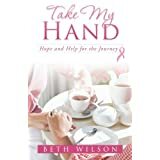 Take My Hand is a must read. We all have a friend, sister, mother, child, or coworker who suffers from some form of cancer. This courageous novelist shares her journey as she battles breast cancer. Her novel honestly describes the real ups and downs, offers hope, a smile or two, and a faith message that strengthens the reader. I have never faced cancer. My burden is macular degeneration. Presently, there is no cure. The end result is blindness. I face many of the same fears mentioned in her novel. I found Beth’s words of encouragement priceless. Her insight is superb. Wilson and her husband share what each partner needs as they face this terrible adversity. Her insights are gifted. I can only give 5 stars, but if more were available, the novel would be ********** stars. Please get your copy today. Share it with your best friends. Laugh, cry, and celebrate life with Beth. Oh Time, Where Have You Gone? I agree. It’s a great story. And I really loved that she had stuff from her husband, too. It helps the caregiver know that what they are going through might not be so different than what others go through. Thanks, Renee. I appreciate your comment. This is only the second non-fiction I have been so excited to share. Normally, my bag is suspense, mystery, and thriller. I will get the book. It takes a great deal of courage to write about such pain. I am happy you took time to stop by. Please be sure to leave your comments. These comments are important to me. I use your ideas to develop posts of interest for my readers. Pamela Wetterman on Recognize a Stalker? Maggie Villines on Do You Have a Stalker? Copyright © 2019 For The Love of Writing by Pam Wetterman.